Each of the water level sensors consist of a solid state submersible pressure transducer encapsulated in a stainless steel 13/16 inch diameter housing. 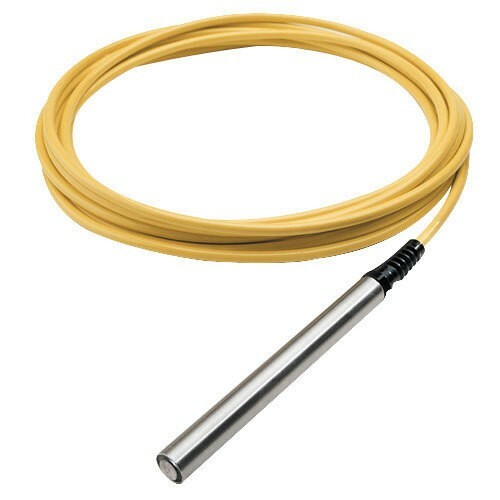 The water level sensor has a molded-on waterproof cable and a two-wire 4-20 mA high level output for connection to a monitoring device. A 25 ft cable is standard, and optional cable lengths are available up to 500 ft. The Water Level Sensor's submersible pressure transducer is fully encapsulated with marine-grade epoxy so that moisture can never leak in or work its way down the vent tube to cause drift or level sensor failure (as is the case with other pressure sensors). The water level sensor uses a unique, highly flexible silicon diaphragm to interface between water and the sensing element. This silicon diaphragm protects the water level sensor's electronics from moisture and provides each sensor with exceptional linearity and very low hysteresis. The design of the submersible pressure transducers eliminates the issues associated with metal foil diaphragms, which tend to crinkle and stretch out over time causing drift, linearity, and hysteresis problems. 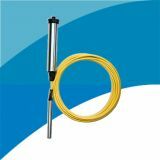 The water level sensor is also has automatically barometric compensation due to the attached vent cable and protected by a stainless steel micro-screen cap, which makes fouling with silt, mud, or sludge virtually impossible. 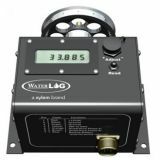 The water level sensor's design is great for all saltwater applications including tide level monitoring, floating docks, and others. 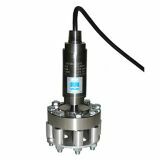 Pressure transducer level ranges of 0-3, 0-15, 0-30, 0-60, 0-120, 0-250, and 0-500 feet are available. 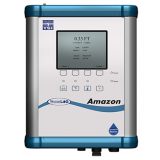 The 0-3 ft low-level range is ideal for measuring shallow flows or small water level changes like those encountered in sewers, storm drains, weirs, and flumes. The 0-3 ft water monitoring sensor accurately measures small changes in water, even when the water's depth is only a few inches deep. Other metal foil-type water level sensors typically have serious problems at low-level ranges because of sensor crinkling, stretching, and drifting. 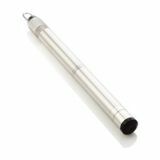 Each submersible pressure transducer has a two-wire 4-20 mA output signal that is linear with water depth. 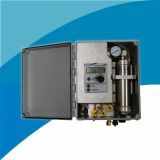 From 10 to 36 VDC is required to operate the water level sensor, so the level sensors can be operated from common 12 VDC battery systems. The 4-20 mA signal can run up to 3,000 ft from the submersible pressure transducer to the logging device. Common twisted pair or electrical extension cord wire may be spliced to the vented cable once the cable is out of the water. The 4-20 mA signal may be converted to 0.5 to 2.5 VDC by dropping the current signal across a 125 ohm resistor. Size: up to 13/16 inch diameter x 5 1/2 in long (2 cm dia. x 14 cm long)(small enough for a 1 inch (2.54 cm) well). Titanium option has 1 inch (2.54 cm) diameter. 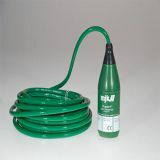 NOTE: When ordering, specify water level range that will cover the maximum water level change for your application (this is not necessarily the total depth of water). Selecting the smallest water level range possible will ensure the greatest accuracy. Water Level Sensor Range: 0-500 ft.
Cable length is measured from top of logger to bottom of sensor. Up to 1000 feet of extra cable can be added at the factory. 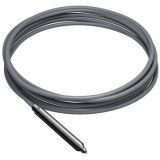 Water level sensor is housed in a 8 inch PVC (PRPP) or stainless steel pipe with 3/4 inch NPT male thread (PRPM) for logging pressure in municipal water systems. 10 ft cable standard. 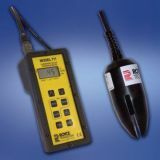 Calibrated in psi with ranges of 0 to 30 psi, 60 psi, 100 psi available. Mouse-shaped cover protects sensor from fouling and velocity effects in sewer, stormwater and irrigation pipe flows. Mouse is attached to 4 inch X 24 inch stainless steel strap for mounting sensor on pipe bottom.